"MacAskill's attitude is simple: it's all about preparation, confidence and positive thinking. But positive thinking goes only so far. MacAskill broke his collarbone in a fall as he turned a corner during a visit to San Diego in October. That was days after he terrified friends by clowning around on his bike on a lookout by the Hoover Dam. Over the years, he has torn ligaments in his ankles, dislocated fingers, broken his right wrist and been a fixture in X-ray rooms around Britain." 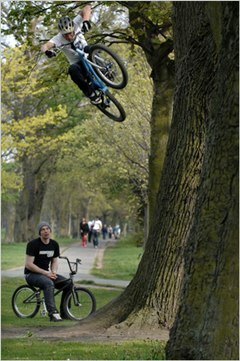 Despite his injury, MacAskill's positive thinking (and daredevil nature) prevails. His skills continue to astound. Check out his latest big ad campaign for Volkswagen, released this past October.